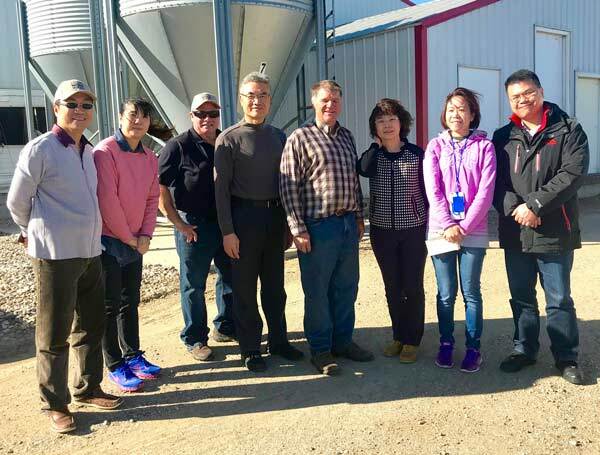 Five grain buyers from Taiwan and two U.S. Grains Council officials got an up-close look at South Dakota farms, a grain elevator and an ethanol plant during a mid-October trade team visit. And they liked what they saw. South Dakota Corn hosted the event in partnership with the Grains Council. The buyers, who work for some of the largest feed companies in Asia, took advantage of several opportunities to inspect corn on the stalk, out of a truck and out of a dryer when they visited the Ryan Wagner farm near Roslyn, the Mark Gross farm near Bridgewater and the Central Farmers Cooperative at Lyons. At the Wagner farm, they got to ride in a combine with Ryan’s dad, Terry, as he harvested corn–always a highlight for international visitors. Ryan Wagner serves as an at-large director for the Grains Council and heads up the council’s Asian advisory team so he’s familiar with international trade and partners. Relationship building and face-to-face visits with customers are also important to international buyers. Wagner said trade teams enjoy seeing family farming operations and their visits help build trust. Because Taiwanese feed companies sell most of their feed to hog and chicken producers in their country, the buyers were excited to visit a hog operation at the Laron Krause family farm near Clear Lake. They toured the facilities, enjoyed a home-cooked South Dakota pork chop dinner on the farm and had detailed discussions with the operation’s swine nutritionist, Jamie Pietig of Hubbard Feeds. They also made a stop at South Dakota State University to meet with swine specialist Bob Thaler, who gave them a presentation and a tour. Lu said members of the trade team learned a lot about how U.S. farmers use equipment and technology to efficiently manage their operations. They were impressed by all of the technological features and safeguards used at the Krause hog facilities and on the SDSU campus, including automatic feeders, waterers, ventilation systems, heating systems and monitors. Taiwan has been a consistent buyer of U.S. corn but has been slow to embrace dried distillers grains with solubles (DDGS). A major concern is mycotoxin contamination. One focus of the Grains Council-sponsored visit was to promote DDGS, demonstrate the benefits of its use in livestock feed and to show that it’s safe. Thaler informed the group that corn grown in the Northern Corn Belt is much less susceptible to mycotoxin. Thaler also explained the improvements that have been made in the processing of DDGS. The trade team learned more about DDGS during a tour of the Poet Biorefining plant at Mitchell and during a visit to Poet headquarters in Sioux Falls. At Central Farmers, the Taiwanese were particularly interested in grain storage and transportation infrastructure. Lu said the grain buyers collected valuable information that they’ll take back to Taiwan and share with their nutritionists. The potential to increase U.S. sales of DDGS to that country is big, he said. After completing its South Dakota visits, the trade team traveled to Minneapolis to participate in the Export Exchange, a conference for grain buyers sponsored by the U.S. Grains Council, Growth Energy and the Renewable Fuels Association. More than 200 international grain buyers participated in that event.